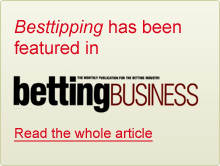 Besttipping receive selections from all the tipsters well before the start time of the event. These selections (the same ones they are sending out to their regular subscribers) are later settled against the day's results and entered into the Besttipping database. We can then display a complete and accurate (and above all, independently verifiable!) record of how each service is performing over a period of time. Subscribing to a service has to be a long-term investment to be worthwhile. Whilst you may subscribe for a month and be lucky enough to show a huge return, the consistent and reliable returns are shown over time. Besttipping can identify how tipsters have performed in the past to help you gauge how they might perform in the future. Choose the service you feel offers the best long term value, make a long-term commitment and decide on a stake amount which does not overstretch you during the losing periods, while at the same time makes the subscription fee worthwhile. Don't leave it to luck, let Besttipping help! Sprint Specialiser’s spectacular start to the year continued in March as a third consecutive table-topping yield propelled the 2019 profit beyond the 100pt mark. Steve Jones’ Daily Bargain claimed second spot with a 40pt gain – his best monthly return since May 2017 - while Mark Your Card also posted a healthy March return of 17.9pt.